We’re so excited to introduce our newest baked good: The Breakfast Cookie! This is truly my dream breakfast / accompaniment to a hot morning beverage. It’s packed with tons of nutrients, zero refined sugars (we use maple syrup and dates to sweeten) and, of course, no animal products. Hope you fall in love with it as much as I have! 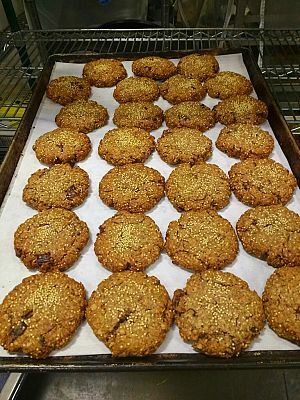 Here’s where you can find our new breakfast cookies in and around Vancouver. GF oats, spelt flour*, coconut*, peanut butter*, maple syrup, coconut oil*, flax, dates*, millet*, vanilla, baking soda, salt, spices *=organic.